If you live in Casper in House District 58, you need to watch this video update about the contested primary taking place here! You see, one candidate in this race has pledged to FIGHT for gun owners in Cheyenne by vowing to sponsor pro-gun legislation and by opposing all forms of gun control! The other candidate publicly supports Universal Firearms Registration, the creation of a statewide gun registry, ‘Red Flag Gun Seizures,’ and has attacked gun rights organizations! 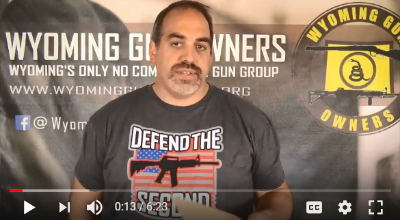 To find out which one is which, WYGO has prepared this short video update for gun owners living in House District 58. Make sure you watch it here! P.S. In House District 58, one candidate has pledged to fight for gun owners. The other has attacked gun rights organizations and is publicly calling for multiple gun control bills!